Constructive Eating presents its Bull Dozer Pusher! Designed with both fun and function in mind the pusher is great for pushing peas into line! Kids will have fun and function in mind at the dinner table. Textured, easy grip handles and detailing allow little hands to hold on tight! Even the youngest child will animate these construction machines with their true-to-life- color, scale and shaping. 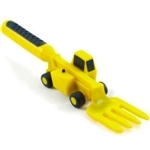 Constructive Eating presents its Fork Lift Fork! Designed with both fun and function in mind the pusher is great for lifting food to where it should go! Kids will have fun and function in mind at the dinner table. Textured, easy grip handles and detailing allow little hands to hold on tight! 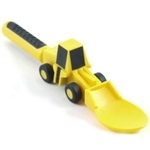 Even the youngest child will animate these construction machines with their true-to-life- color, scale and shaping. 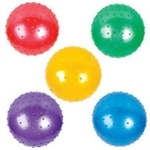 Pack of small inflatable(4"-5" diameter when fully inflated) knobby rubber balls. One of each color provided. Clamshell package contains one Construction Plate. Our Construction Plate is dishwasher and microwave safe.